We are pleased to offer our services to you 6-days a week. with multiple ranges, products and classes offered, we have something for every Shooter, Hunter, Reloader or Firearm enthusiast! Stop-in Today and Get To Know Us - Become Part of Our Family!! We specialize in sales of firearms and supplies. We offer multiple pistol, rifle and shotgun ranges for practice and classes. You'll find plenty of elbow-room for your equipment and most ranges have a pavilion cover to protect you from the elements. Give us a Try! 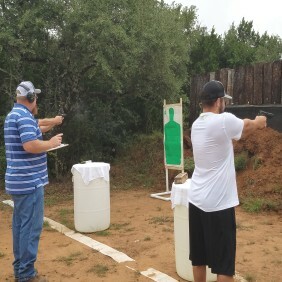 At Way-Out-West Shooting Center, we offer firearm training by professional instructors. From basic pistol, rifle and shotgun instruction, hunting tactics, home/self-defense classes, you'll be in the best of hands. See our Classes and Registration page for more info! Whether you prefer a rifle, pistol or shotgun, we have a place for you! We are located on 77 acres of unimproved ranch land. Ranges are bordered by old growth trees and underbrush. All our roads are ranch-style (dirt). Visit Our Facilities page to learn more! We carry a full-line of quality firearms. If we don't have it, and it's available, we can get it! As a bonus you get 30-days FREE range-time with a firearm purchase from our store. We carry a wide selection of accessories as well as cold beverages! Come check out our retail store and find some great deals on guns, equipment, ammunition, scopes, bags, safety glasses and other accessories that a gun owner might need. The Way-Out-West Retail Store is geared to meet our customer’s needs. Inside you’ll find a friendly staff and you can learn about our other services: gun cleaning, rifle sighting, minor firearms upgrades, registration for a variety of firearm training classes as well as LTC/CHC education, Federal Firearm Transfers and much more. Hope to see you soon! We are currently stocking a large assortment of handguns (Glock, Ruger, SigSauer, Smith & Wesson, & Springfield, ETC) and rifles (Tikka, Henry, Ruger, Browning, Crickett22, AR’s and ETC) and a wide variety of AMMO!! We can also custom order items! Stop-In and Get to Know us!! WE PROUDLY SUPPORT THE SANTO YOUTH ASSOCIATION! GO WILDCATS!! While safety is always a top priority at Way Out West Shooting Center, we do pride ourselves on having a laid-back atmosphere. Range officers do routinely check on shooters, but unlike other ranges, we let the shooters shoot. Range officers will enforce rules, but we rely on individuals policing themselves. We ask all our shooters to look-out for unsafe practices and behavior. The range does not allow any tracer bullets, explosive ordinance (tannerite), steel core bullets, or other highly flammable ammunition. 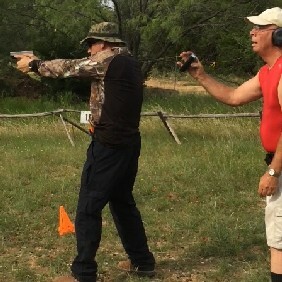 We ask that shooters only shoot pistols at the pistol range and rifles at the rifle range. As a family-owned, private shooting range, we pledge to offer our customers an exceptional shooting experience. If at any time, you have a question or need our assistance, we are here to help! 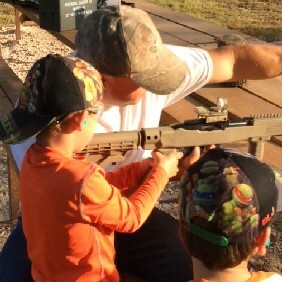 Become a part of the Culberson Family and Way-Out-West Shooting Center. We want to meet you and get to know you - so drop-by and say "Hello" soon. We are conveniently located just minutes from the Dallas-Ft. Worth Metroplex, and our reach includes Stephenville, Granbury, Weatherford and Mineral Wells shooting enthusiasts.... and only 2 miles south of I-20 on US 281.